Garda Commissioner Nóirín O’Sullivan is to issue an order later on Tuesday to all Garda members to turn up for work on Friday, when a mass withdrawal of service is planned. In a move that will greatly increase tensions in the Garda pay dispute row, Commissioner O’Sullivan is ordering those whose shift falls on Friday to be present for work. But she is also planning to cancel all rest days and all leave, meaning every member of the Garda will be ordered to be present at their posts and Garda stations on Friday. Should You Work For Free? Just A Latte Then, Thanks Animation: Monday How Much? Posted in Misc and tagged Garda Commissioner Nóirín O'Sullivan, order, Strike, work at 4:07 pm on November 1, 2016 by Broadsheet. This action by Noreen , will ensure she has the full unconditional support from the Minister for Justice and likely the cabinet for long into the future, clever commissioner …. It will also ensure the escalation in hate from her own members. But i guess she weighed up the risk and decided that Government are better allies than her police force. 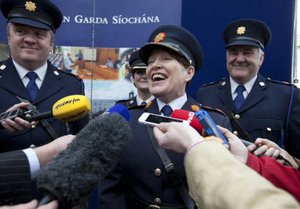 That Garda on the left of the photo is the most Garda looking Garda I’ve ever seen. But whose going to stand leaning against a wall, looking at their phone while mayhem ensues around them? Wouldn’t ordering Gardai in on rest days be breaking the Working Time Act? Will the Gardai who work their rest day be remunerated at an overtime rate for these extra hours? Q2. Answer is not necessarily.